We were founded in 2003 as Body+Soul: Whole Living. Since then, we've been at the forefront of the movement to live a healthier, more sustainable, and balanced life, striving for total wellness for mind, body, soul, and planet. 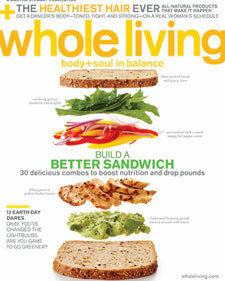 In June 2010, we began publishing under the name "Whole Living: Body + Soul in Balance." At Whole Living, we believe that possibilities always outdistance limitations. We know that "yes" is more powerful than "no" and that cultivating your soul is as important as caring for your body. We believe anyone can create a life of beauty, deep satisfaction, and radiant good health. We believe you don't need an entire life makeover to enact healthy, positive changes that benefit you, your family, and the planet. In all aspects of living, small and meaningful steps can yield profound results. 1. Happiness is a choice. Make that choice today and every day. 2. Good health isn't a gift; it's a habit you cultivate. 3. A healthy, fit body is not enough -- true fitness engages the spirit. 4. Think more about what you should eat than what you shouldn't. 5. Laugh at yourself. You're funny. 6. Nurture your spirit. It's your source of strength. 7. Stay connected to the natural world. It will feed your soul. 8. Believe in yourself. Your intuition is rarely wrong. 9. It's never too late to take the first step toward your aspirations. 10. What you pay attention to will thrive.